I don't think there can ever be enough pillows. 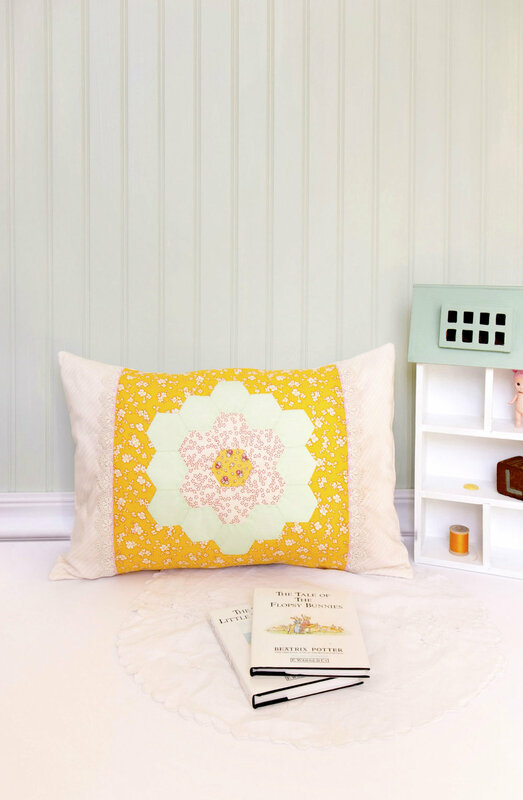 I have an image in my mind of a corner filled with all cute handmade pillows and stuffed animals and one of my kids sitting in it reading. My boys drag multiple pillows with them around the house. (and a blanket or two for Jude- apparently he's always cold. That usually happens if you prance around in only your underwear, son.) So, I figured I'd get a start on amassing a big pillow pile for Lyla. :rose: Whether she becomes the type to sit quietly and read books :angel: or dive bomb off the couch, there's going to be the need for many pillows. 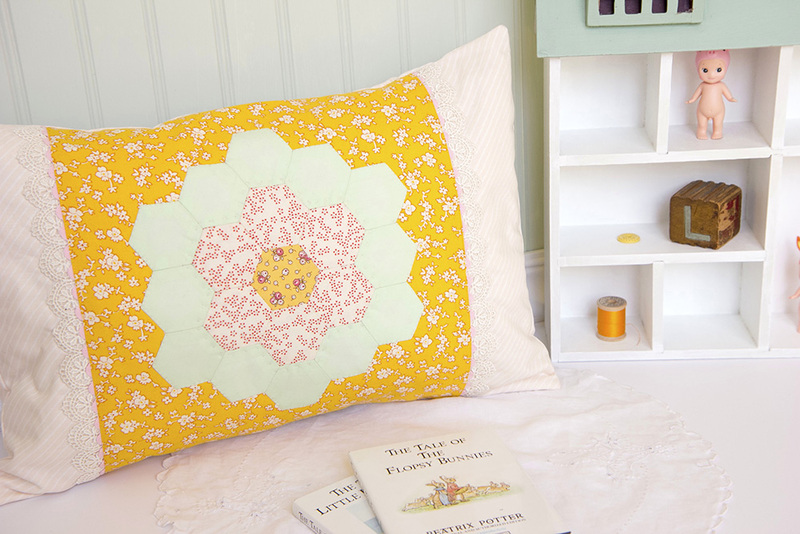 This pillow started off with an English paper pieced hexie flower and it grew from there. I'm really wishing I bought more of the plain mint fabric, I think I only bought half a yard? ಠ_ಠ The yellow fabric was a part of a fat quarter bundle that was a gift from my mom and it ended up being the right backdrop. A little pink ric rac and lace sweetened it up. Plus, one thing I like to do with lace is hand stitch it down on the edges. I never liked when it'd flap around especially after being washed. The same goes with ric rac when it curls up! Lay flat and perfect forever dangit. This is my desk currently. Clean. We'll see how long that lasts. My husband bought me a new extra long gaming mouse pad and plain black was a little too bleak. I had to make it cuter using some of my favorite :strawberry: strawberry fabric (Atsuko Matsuyama). I didn't actually sew it on, it only goes about an 1" in on the bottom and I topstitched around to kind of trick yah. This way I'd still have the grip underneath and can remove the fabric to wash if I want. I'm also currently working on Lyla's high chair. It's a Craigslist find- Jenny Lind style; in need of paint, new hardware, and a cushion. 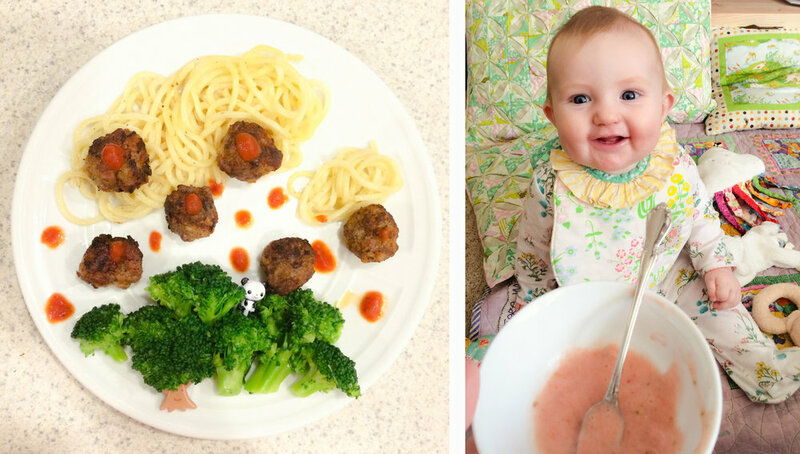 Lyla has been eating solids for about a month now and I'm about ready for her to be off the floor now!